WATCH How A National Monument - Ilojo Bar - In Lagos Was Demolished by "A Developer"
The Ilojo Bar (also called the “Olaiya House” or “Casa do Fernandez”), is a Brazilian-styled historic building located near Tinubu Square in Lagos Island, Lagos State, Nigeria was built in 1855 and bought by the late Alfred Omolona Olaiya in 1933. It was built by Africans who regained their freedom from their “Portuguese masters” in Brazil. Its historical, social and architectural values have been well acclaimed, thus, prompting the Federal Government to give it special protection status as a National Monument through Gazette 25 Vol. 43 of April 5, 1956. It was pulled down unexpectedly on September 11, 2016 by a “developer”. The family’s lawyer, Olanrewaju Falola, in a statement said the building developed noticeable cracks on the walls, with its roof falling off. He said the family wrote several letters to the commission, whose duty it is to maintain and preserve artifacts, notifying it of the state of the building, but it was not repaired. The family said it also sought the commission’s approval to renovate the building to forestall any calamity, but got no permission. According to Falola, the Lagos State government through its regulatory agencies issued contravention notices on the property, which he said was also brought to commission’s attention, yet it allegedly failed to act. An integrity test, he said, revealed that the building was no longer safe for human habitation. “Thereafter, the Lagos State Building Control Agency (LASBCA) ordered the family to demolish the distressed Ilojo Bar and further warned that failure to demolish same would amount to negligence on the part of the family and the property will be forfeited to the state government,” the lawyer said. The family, he said, was given a demolition approval, following which it asked LASBCA to bring down the distressed building. “We hereby state that the demolition of Ilojo Bar was done with the express order, instruction and approval of the Lagos State Government in the exercise and performance of its statutory duties and for the protection of lives and property,” Falola said. The family wondered why the commission allegedly neglected the edifice for such a considerable length of time that it constituted a threat to lives and property. “Why would the commission have neglected the so called monument to the extent that it became not only a public toilet but also a haven for criminals?,” the family asked. The National Commission for Museums and Monuments has been maintaining, promoting and preserving the monument with members of the Olaiya Family, Lagos State government and other stake holders both local and international. The threat to this historic building has been unfolding for sometime due to rising commercial interest in view of its strategic location. In October, last year, a member of the family wrote to the Commission saying that one of them was trying to engage a private developer to demolish the monument and clear the place for commercial development. In response to this, a meeting was called with the family members led by Mr. Daniel Adewale Olaiya on January 19, 2016. The meeting discussed the issues around the monument, including its legal status, how the structure is put to use and the grievances of the family members. It was finally agreed that the statues quo of the monument should remain while they submit their complains through appropriate official channel but nothing was heard from them since then. The recent threat to demolish the monument came on July 2, 2016, when a developer in collusion with some members of the family mobilised a bulldozer and some armed men with the intent to demolish the structure. The National Commission for Museums and Monuments got information about the move and quickly mobilised the Lagos museum staff and Lagos State government officials, who accosted the group and frustrated the attempt. In the meantime the attention of law enforcement agencies was drawn. On July, this year, the developer again mobilised to demolish the building and this action was again rebuffed this time through the intervention of Hon. Agboola Dabiri Special Adviser to the Lagos State Governor on the Lagos Central Business District.Following his intervention,a stakeholders’ meeting was summoned at Lagos State secretariat Alausa, Ikeja where Hon.AbikeDabiri-Erewa did everything possible to avert the demolition of the monument. Subsequently on Tuesday, August 16, 2016 a stakeholders’meeting was convened by the National Commission for Museums and Monuments at the National Museum, Lagos involving major stakeholders. This include members of the Olaiya family, management staff of National museum, Lagos, representatives of Lagos State Ministry of Tourism and that of the Brazillian Consulate, Benedita Gouveia Simonetti and Adeniran Arimoro. During the meeting, the stakeholders agreed that steps must be taken to safeguard the monument from any threat, including involving law enforcement agencies and placement of notice on the site notifying the public about the status of the building. The meeting also agreed to revive an earlier plan to organise a gala night to raise funds for the rehabilitation of the monument. To our greatest surprise however, on Saturday, August 27, 2016, the same developer again mobilised his bulldozer and actually damaged a portion of the building. A petition was written and submitted to the Area Commander of the Nigerian Police (Lion building), requesting the arrest and prosecution of the culprits but apparently the police did not find the matter serious enough to detain or prosecute them. Seeing the levity with which the Area Command handled the matter, another petition was written on August 29, this year to the AIG Zone 2 Onikan. Meanwhile on Thursda, September 1, 2016, Hon Dabiri-Erewa was again approached and he gave an official letter to the Special Adviser to the Governor on Urban Development requesting the ministry to withdraw a letter of permit for demolition said to be given to the developer. Another letter was written to the Governor intimating him about the status of the monument and seeking his assistance to safeguard it. 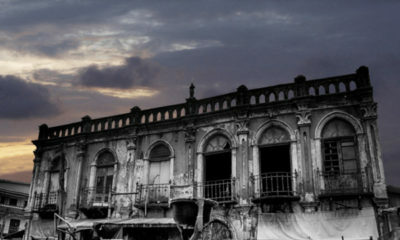 However, despite all the efforts of highly responsible and patriotic individuals and government agencies, the developer on the eve of Eid-el Kabir (September 11, 2016) sneaked in with his instrument of destruction and wilfully demolished the Ilojo Bar, an outstanding historic and architectural monument that has adored the cultural landscape of Lagos Island for nearly two centuries. This sad event is a critical turning point in the history of heritage management in Nigeria. The shocking way the action was carried out without any shame and embarrassment is a source of serious concern for the National Commission for Museums and Monuments as heritage managers and for all responsible Nigerians who love history and culture. The action is not only criminal, but it has robbed us of an important heritage resource that helps defines us as a people and assist our understanding of our past and our projection of the future. 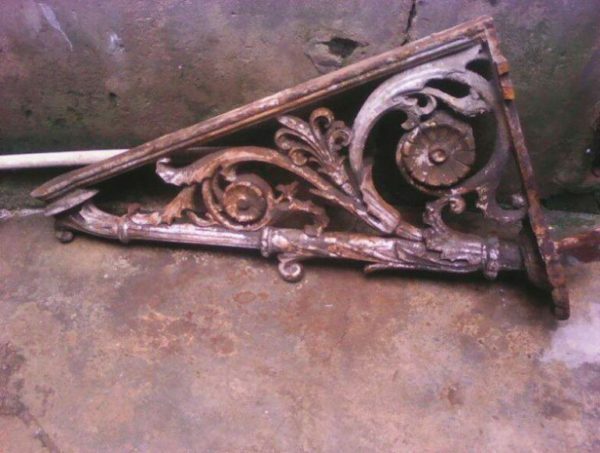 The demolition has destroyed a masterpiece of the only surviving Brazilian houses in Lagos with its attractive arches and fine iron works as statue described as being “Gothic in style and balustrade reminiscent of a Venetian palace”. It has done great injustice to the credit of African craftsmanship in architecture which has exerted great influence on Yoruba architecture that is today visible in all parts of Yoruba land. Indeed, the demolition has eliminated the tangible evidence of social and cultural impact of the transatlantic slave trade and its abolition. It has wiped away an outstanding source of memory and history of freed slaves and their roles and impact in the evolution and development of cosmopolitan urban Lagos. At the same time it has destroyed one of the outstanding symbolic evidence of cultural ties between Nigeria and Black diaspora in general and Brazil in particular. 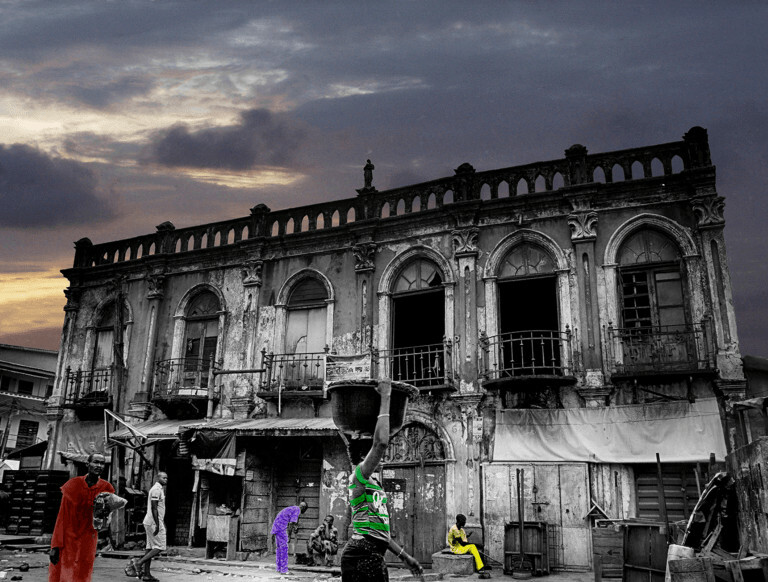 This dastardly act has distorted the eminent position of Lagos in colonial history as centre where returnee slaves from Brazil built houses in the new architectural fashion when Lagos was created as a colony, thus impoverishing Lagos of its rich architectural urban history and undermining its acclaimed status as centre of excellence. However, the NCMM will not rest on its oars until the perpetrators of this dastardly act are brought to book. In line with the powers and responsibilities conferred on it by NCMM Act, Cap N19, Laws of the federal republic of Nigeria 2004, the NCMM will ensure that criminal action is brought on the culprits as well as demand full compensation for the demolished monument. It will be reconstructed and fully restored according to professional restoration standards. We wish to assure all Nigerians that the Ilojo Bar will be restored as it is a fully documented National Monument with an up-to-date and comprehensive documentation of its architectural history and design details. Consequently, NCMM is poised to restore Ilojo Bar back to its original authentic form. In the meantime, the site of the monument being an integral heritage space is being explored for rescue archaeology and heritage impact assessment. We call on all well-meaning Nigerians to join the National Commission for Museums and Monument in saving, protecting and maintaining our national heritage resources. However, following an investigation by Kola T. of Ktravula.com, one part of the building was sold to a resident for N700 by hoodlums in the area during the demolition. 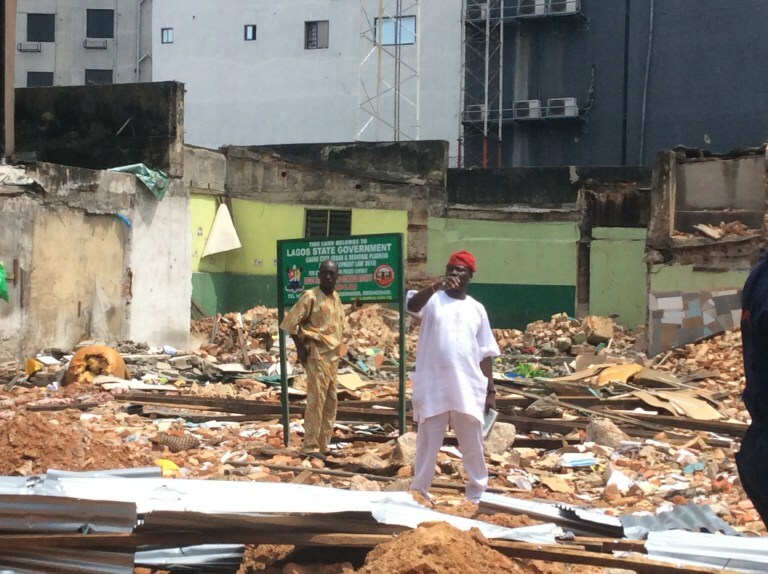 Kola said that officials of the Lagos State Building Control Agency (LASBCA) have pulled down the artificial fence put up by the said developer after the demolition, and erected a green sign post they had brought along on which Lagos state asserts its claim to the space, warning trespassers off. 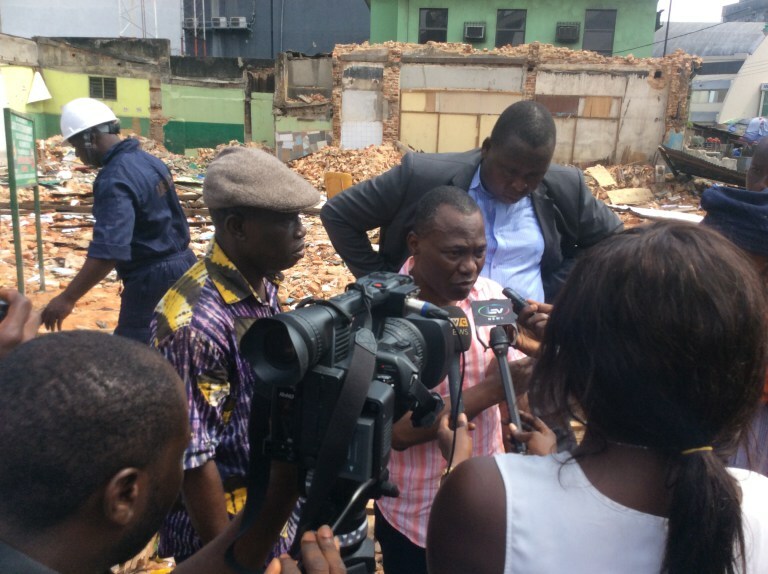 Kola said that he had asked the the head of the LASBCA Oladotun Lasoju (wearing the cap) and the General Manager of the Lagos State Physical Planning Permit Authority (LASPPPA), Remi Oni-Orisan (speaking to newsmen) what the state did to stop the demolition as it was going on. “What if they demolished it during the holidays when officials weren’t around?,” was the response he said he got. OMG… This place could have been refurbished and turned to Money literally.. This is a nonsensical country se….I’ve been saying this thing since. We do not appreciate historical buildings. We have no restoration culture. I’ve pretty much given up on Nigeria. Every country is moving forward and learning more about the importance of preserving its history and Culture and then you come to Nigeria and it is another story in total. So many Backward thinking bunch of miscreants in that country, starting from the people in Government smh! I did not even bother to read through the whole story abeg. If only Lagos Government knows how much they can make from such historical building they wont dare demolish it. I remembered one Saturday morning during my weekend jogging around Mende Maryland area of lagos overhearing two grown adults boasting to each other about the worth of their father’s houses in the neighbourhood. I shook my head in disgust as two married men placing monetary value to their fathers’ property! That is the story of all family legacies (properties/assets) to be preserved but the so-called prodigal children in collusion with “developers” find a way to sell these legacies for “feeding-money”. I’ve seen where a family building was sold and the remains of the parents buried in the compound evacuated and taken away in a sack by the deceased children. Oh no!! !Nigeria will remain underdeveloped for a very long time.Why on earth will a beautiful piece of history like this be destroyed.I totally agree with the Eurocentric scholars who says Africans have no history,our history is clouded in obscurity.We find it difficult to preserve what we have as history.Continue to destroy the remains of Africa,our children’s children will never forgive you. Dirtbags. No sense of long-term responsibility… Happening all over the world. Come to jos museum and see how historic cars given to Nigeria by different countries are wasting away!!! Kids jumping all over it and shitting in them. I breaks my heart. Are the respective government agencies alive to their responsibilities? It is not enough to sign laws and edicts to preserve monuments. What did the agency do to protect and preserve the building over the years? Why didn’t the government acquire the property from the family from the onset and ensure that ownership is removed from the family? Why oooohh Why Nigeria????? You will eat everything finish TODAY and leave nothing for your future and children. our mindset is messed up. In 2009 I visited an elderly couple in Onikan, Lagos with my colleague. They had a lot of nicely handcrafted African ornaments in their living room. As we were leaving, I noticed a huge concrete slab in the corner. Apparently it was the commissioning plaque for a building somewhere in Onikan which commissioned in the early 1960’s by Abubakar Tafawa Balewa. I asked the husband where they got it from and he said casually “I was out one morning and saw it by a rubbish dump so I brought it home.” The building of course had long been demolished. Commissioner of tourism is Dead in LAGOS!!! I am rhe grandchid of Mr. Afred Omolona Olaiya who owned the house and I truly unhappy about some of the things I have heard in the lead up to the demolition. I had no hand in it but strongly feel that a replica house needs to be rebuilt and used as a museum for generations to come.